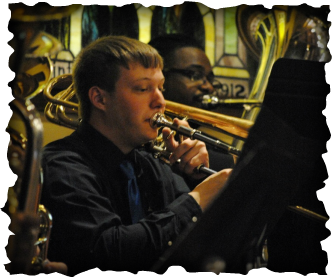 Under the direction of Mr. Michael Wright, the Gateway Brass Ensemble (GBE) began in 2013 as an idea over dessert at Mt. Pleasant’s Yogurt Yeti. Founded as a sister ensemble to Clare’s Gateway Community Band, the group quickly grew to 20 members in its first few months. As its name suggests, the GBE is a volunteer group for local brass & percussion players, ranging in age from high school to retired. To see and hear what the GBE is all about, visit our Media page. Unfortunately, Michael had to step down as director in the spring of 2016 because of time constraints, and the group has yet to find a replacement. In the past, the GBE rehearsed once a week in the Clare High School Band Room. Its mission was to perform several concerts for the Mid-Michigan community every school year, including collaborations with other music ensembles and local events. For a complete listing of the GBE’s past performances, visit our Concerts page. Although anyone was encouraged to join, our members were primarily Gateway Community Band players, current & retired band directors, and music majors from Central Michigan University. To see a complete list of our musicians and support team, visit our Personnel page. Also be sure to check out the links at the bottom of this page for information on Gateway Bands advertisers, policies, bylaws, and a list of other music ensembles in the Mid-Michigan area.